Following the lifting of the Western sanctions regarding its nuclear program, Iran seems to be in the focus of European and Asian businesses; London-based political commentator Chris Bambery told Radio Sputnik why Tehran is gradually becoming a "prime investment area for Western capitalism." On Wednesday, major aviation giants Airbus and Boeing announced that they have received permission from the US government to sell aircraft to Iran, part of a series of landmark deals potentially worth some $50 billion in total following last year's nuclear accord. Airbus announced that early on Wednesday it received a license from the US government for its first sale of seventeen planes to Iran. In January the EU-based company said it struck a deal with Tehran to export 118 jets, estimated to be worth some 22.8 billion euros ($25 billion), but has been waiting for Washington’s approval since. The company said it hoped to receive the second license allowing it to sell the remaining planes to Iran soon. Though based abroad, Airbus needed the approval of the US Treasury for the deal because at least 10 percent of the manufacturer's components are of American origin. Another major aircraft producer — Boeing – has also received a license to sell eighty planes to Iran, with a total list price of $17.6 billion, with deliveries beginning in 2017 and running until 2025, according to the manufacturer’s statement issued later on Wednesday. Iran Air also will lease 29 new Boeing 737s in a deal that Iranian officials have suggested would be worth some $25 billion in total. The move follows last year’s deal between Iran and the world's powers which allowed easing economic sanctions on the Middle East state in exchange for Tehran promising to curb its nuclear activities. Also on Wednesday, Japanese Prime Minister Shinzo Abe expressed willingness to visit Iran and boost economic ties with the country. The announcement came after a meeting with Iranian President Hassan Rouhani on the sidelines of the UN General Assembly in New York. Abe said he would like to visit Iran at an appropriate time, and called for an improved business environment in the oil-rich country so more Japanese companies can invest there, according to a senior Japanese official. London-based Middle East expert Chris Bambery told Radio Sputnik why Tehran is gradually becoming a "prime investment area for Western capitalism." "The realm we have to take into account is that it is clear that major industrial powers are competing with each other for the emerging Iranian market," Bambery told Sputnik. 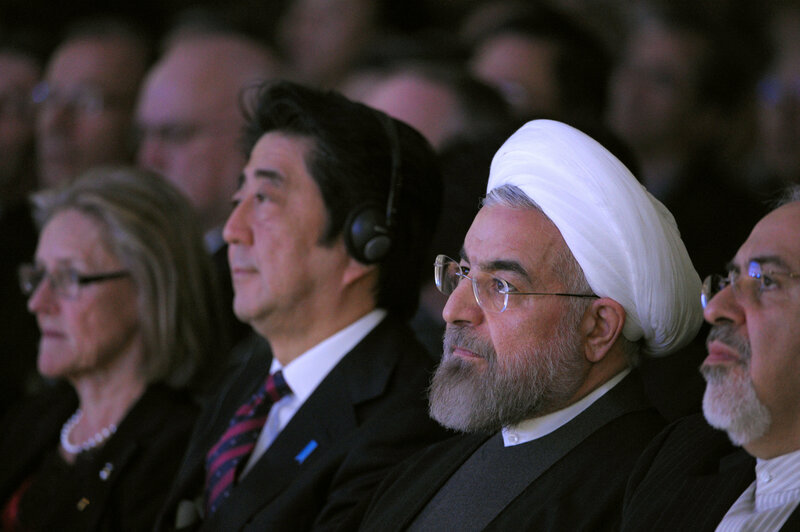 "The fact that Japan's Prime Minister Abe is going to visit Tehran soon signifies that the Japanese might get into the action here. The Germans are very keen to do business with Tehran, they have got long established relationship with Iran which did not disappear after the 1979 Revolution," the expert explained. America, he suggested will be nervous, as it doesn't want a new emerging market to be gobbled up by its rivals in Europe, Japan or China. Therefore it will be under some pressure to do business with Iran and in the course of which it will probably lift their banking sanctions, he said. Commenting on the decision of the American air companies who want to do business with Tehran, the expert explained that Iran seems to be a huge market due to its aging fleet, and the American companies "don't want to be kicked out from Tehran." However, Bambery noted that "there are two pressures there." First, there is the hostility which still exists between the US and the Islamic Republic of Iran which flows from the 1979 Islamic Revolution and US Embassy takeover, also known as the hostage crisis of 1979-1981, "for which America never had revenge." The second challenge is that there are countries competing against each other for the Iranian market. "So America will be looking at Japan, India, China and Europe and its investments with trepidation," the expert suggested. The Iranians, on their part, "are not going to be a soft touch for any international investment," he said. They have defended their national sovereignty, they are aware of what happens, as it happened in the past, when a new market comes onto the scene, Bambery said. "They will be remembering the humiliation of Boris Yeltsin's years in Russia, when Russia seemed to open itself up to anything the Western multinational companies wanted to do. They will work out their own system of "doing with the west" which will benefit them while building their own industrial economy," he suggested. "Iran is a potential new big market for the western and the Asian countries. It has got a young educated workforce. This is prime investment area for Western capitalism. And the countries will be queuing up. In fact, they are already queuing up to do business in Iran. The US will want to be in that queue and not in the back," he said. Bambery also noted that people from Europe now go on holiday to Iran, "which is a fantastic country with a really interesting history and culture." There is good potential for investments into new hotels, he said. "You can imagine the American multinational hotel chains thinking about the opportunity. It might become a huge tourist market," he suggested. However he noted another obstacle: Iran has long been demonized in the Western media, particularly in the US and Britain. "Iran has a long history of contributing to the world culture. It has fantastic people, very generous and friendly and very educated. And the more contact there is between Iran and the west, the better. The sooner it is going to overcome this demonizing image which has been built up in 1980s-1990s the better," he finally stated.